This game was made in 48 hours for Ludum Dare 42. Artwork by Val, Code by Emerson. Featuring fantastic tunes by Tenkitsune! 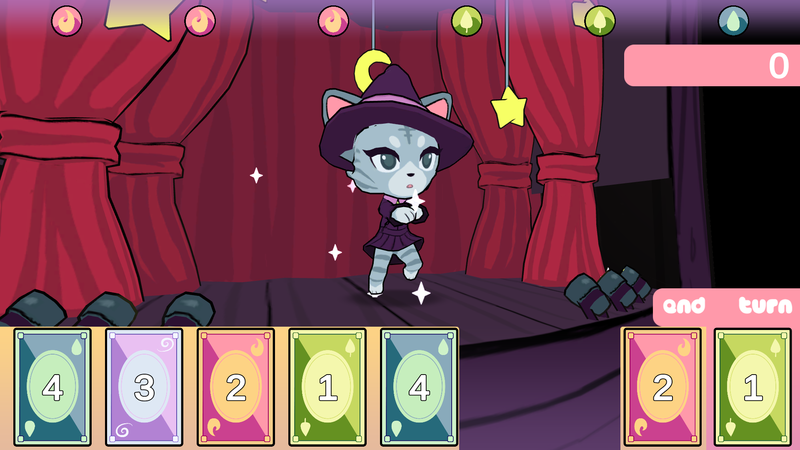 Meow Moves is a musical puzzle game in which you play a dancing cat witch. Combine cards to build up magical moves as you dance on stage, playing specific elements to match the audiences interests. Each level deals you a deck and a number of turns. Looking at the top of the screen from left to right shows what element you want to play. Looking at your hand of 5 cards, you play your hand. Putting two cards of the same color on top of one another adds them, putting two of different colors subtracts them. Lay your cards out on the far right cards to adjust their values. Clicking End Turn submits the right most card and moves your score up. Watch out though, playing the wrong card cuts your score in half! 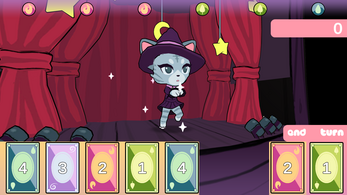 Meow Moves updated to version 1.1 with new mode! Fixed score issues in WebGL build! Love the model and the animations for the dancing! Had a hard time making sense of the card mechanics but I eventually got the hang of it. Thank you so much for playing! Val's really freaking good at what she does. And yeah, wish we had time to make a tutorial.